Moving to a new home in a new state can present some challenging garden issues. I moved from Florida to the Piedmont of North Carolina in October. Too late to start any kind of outdoor garden, I knew I would need to take my time and discover new features about my property. First, I needed to locate my septic tank and make sure I never plant anything near it. One of the most important features to look for is to watch how the sun and shady parts of your property change as you get closer to spring. Since my property is so wooded, I have decided to do container gardening my first growing season to make sure I don't build my garden in the wrong location. In January I began to collect small containers to start plants. Egg cartons, mushroom containers, and small pots from the dollar store proved to work just fine. In February I purchased good quality potting soil, seeds, and started some of my plants such as tomatoes and peppers in my nice and sunny south facing window. It is easy to know which plants you can start 6-8 weeks ahead of time by reading the back of the seed packet. By April I was ready to get my container garden going. I have learned that in April there are two issues you need to watch out for. First, be sure you don't transplant to larger outdoor pots before your last frost and you may want to wait until after the leaves on your trees have popped as the pollen can be very thick for a few weeks. Just about all vegetables can be grown in a container. It is as simple as making sure you choose the correct size container for what you want to grow. A shallow pot can be used for any vegetables that grow above the soil such as tomatoes, peppers, lettuce, summer squashes, cucumbers, peas and beans. A deep pot needs to be used for root type vegetables that grow in the soil such as radishes, carrots, and beets. Also, don't skimp on your potting soil. It is worth spending a few dollars more for a good quality potting soil enriched with fertilizers that will promote the success of your plants. You will also need some kind of stakes to support plants such as tomatoes, peppers, peas, beans, and cucumbers. Many times you can make your own supports by using sturdy sticks or wire mesh cut to fit. I have found that container gardening has a lot of advantages. I am enjoying being able to move pots to sunny locations or underneath a roof to protect them from a violent storm. Watering containers is easy and can be made even easier by inserting a small cup or plastic bottle perforated with holes in the container near the plant. I no longer have to dig and weed, and keeping the containers on my deck assures me that deer will not be making a meal of my plants. 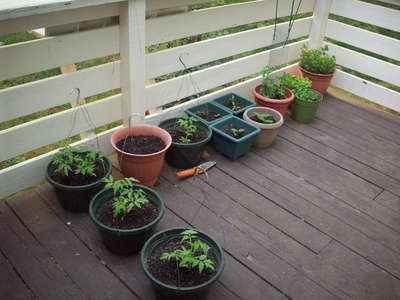 So, if you aren't sure about where to put a garden, don't be afraid to try container gardening. You may even prefer it!